Tobrex is one of the very best choices to treat bacterial eye infections. You still need to know how to use Tobrex ointment and Tobrex drops properly to get better results. There are a number of medications available for external eye infections, and Tobrex 0.3%is one of the most commonly used topical antibiotics. It is important that you use Tobrex ointment under supervision of your doctor, even though it is generally safe. It is equally important to understand the right way to use tobramycin ointment to clear an eye infection. Keep reading to learn more about Tobrex ointment and the right way to use it safely. The generic name for Tobrex is "tobramycin", which is from a class of drugs known as aminoglycoside antibiotics that work by stopping the growth of bacteria. 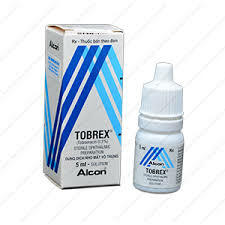 It is worth mentioning that the Tobrex ointment is effective only against bacterial infections and may not work at all against other types of eye infections. Its effectiveness may also come down with excessive or extended use. Before you start using this tobramycin ointment to treat your eye infection, it is import to keep a few important things in mind. You should avoid wearing your glasses while you're using Tobrex. It is equally important to sterilize your contact lenses when you start using them again. It is important not to use any other medication soon after using Tobrex ointment. Wait for at least 15 minutes before you apply another medication. Use it regularly to get positive results. It's important to use it at the same time every day to yield maximum results. Be sure to continue using the medication for the prescribed duration even if the symptoms are no longer present. Stopping it too early will cause the infection to develop again. Contact your doctor if your condition doesn't improve or becomes worse. Use the following instructions to apply the ointment to your affected eye. Wash your hands before application. Don't touch the tip of the tube to avoid contamination. Don't let it come into contact with your eye. Slide your head back and pull down your lower eyelid while looking upward. Place about half-inch strip of this topical antibiotic into the pouch you create by pulling the eyelid. Look downward and close your eyes for a couple of minutes. You may roll your eyeball in all directions to ensure the medication spreads into all corners of your eye. Don't blink and never rub your eye after application. Use a clean tissue to clean the tip of the tube before recapping it. Use it as often as your doctor has directed. Tobrex ointment is generally safe. In fact, many people using it may not experience any side effects whatsoever, but sometimes it may cause certain side effects as well. Some of the most common side effects are tearing, blurred vision, eye discomfort, eye redness, and eyelid itching. These symptoms should resolve in a couple of days though – call your doctor if these effects persist or become worse over time. You should also ensure that you don't use it longer than the prescribed duration or else it may lead to a new fungal eye infection. You should contact your eye specialist immediately if you notice worsening symptoms. You should also seek immediate medical attention if an allergic reaction develops. The symptoms of an allergic reaction include severe dizziness, rash, and trouble breathing. You should contact poison control center if you swallow this medication by accident. It is important not to share it with others. What's more, you should take special care to take a dose at the same time every day, but if you miss it, take it as soon as you remember. Don't skip it. What About Tobrex Eye Drops? As the ointment, its generic name is tobramycin and is effective against bacterial infections. The eye drops won't work if you have a fungal or viral eye infection. It is important to start using these eye drops only after talking to your doctor, especially if you're pregnant or are breast-feeding your baby. Shake the eye drops well before using. Tilt your head a bit and pull down your lower eyelid to create a small pouch. Place the dropper right above your eye and squeeze to put a drop into the pouch. Close your eye and apply some pressure to the inner corner of your eye for a minute or so to ensure the liquid doesn't drain down your tear duct. Take a 5-minute break between drops if you're using more than one drop per eye. It is important to follow the directions provided by your doctor, but you can increase the dose during the first 24 hours and put a couple of drops in your eye after every two hours. Decrease this frequency gradually and ensure that you don't stop using these drops prematurely. Be sure not to use more than 20mL initially – your doctor will evaluate your condition before refilling the drops.